When the Government first unveiled its commemoration programme for 1916, it was widely viewed as short-term, shambolic and superficial. Since then a former leader of Fine Gael put forward the view that the Rising was not needed and was a civil war. Following widespread criticism, and in the run-up to the elections, the Government has brought forward a more fitting commemoration. This is to be welcomed. However, there remains vacuity at the centre of the plans. This Government just doesn’t get 1916. It is an inconvenient issue and you get the impression that it just wants the commemorations to be out of the way and to return to business as usual. Its approach has been to strip away any politics and context to the Rising: to reduce it to a tragedy in which death and injury was inflicted equally on all sides, and so all sides must be equally remembered. This is a shallow and wholly self-serving approach to our history. Devoid of context or politics, the Rising is portrayed as a moment in history that should be kept in a little glass case and studied; or, in the view of some in the Redmondite wing of Fine Gael, an unnecessary moment of madness. War is brutal. It visits death and injury on all sides. The grief of a mother and father, brother and sister, or son and daughter is not diminished by circumstance of that loss. The grief of the family of a Royal Irish Constabulary member was no different from that of a member of the Irish Republican Army who fought in the GPO or a civilian killed on the streets. All have the right to be respected and remembered. However, it is wrong for the State commemoration to be reduced solely to an act of remembrance for a collection of individuals. While each has a story of individual courage and loss, those involved in the Rising were more than a collection of individuals. They were an army and a movement with a shared republican politics, shaped by their experience of the British empire and world war. 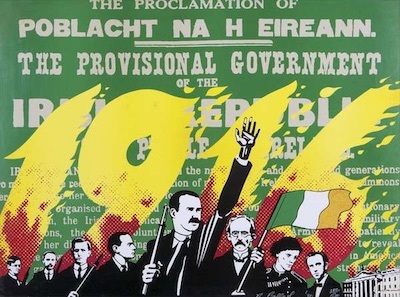 Those who took part in the Rising gave their lives and liberty to deliver the republic enshrined in the Proclamation. A republic built on the principles of equality and sovereignty, of human rights and civil liberties, and of unity and nationhood. Principles that remain a challenge to successive governments in this State. It is in these principles that we find the Government’s problem with the commemoration. For this Government, it is easier to deal with the notion of individual loss and sacrifice than promote the ideas of the Proclamation. So the Government does not address the inequality, division and lack of sovereignty that drove a generation of republicans on to the streets. They even proposed to rewrite the Proclamation and hope we forget that the original one has been undermined by the actions of successive governments. Heaven forbid we mention the North or the failure that is partition. The memory and ownership of 1916 does not exclusively belong to Sinn Fein, any other party or the Government. The commemoration of the Rising cannot be limited to a lecture, an exhibition or a parade. It belongs to the Irish nation, all the people who share this island and the Irish nation spread across the globe. While the commemoration must be an opportunity for remembrance, it is also an opportunity for national renewal, for building a new republic. In the last election, the Government promised a democratic revolution and delivered hardship, inequality, continued loss of sovereignty, a hands-off attitude to the North and the Belfast Agreement. There is a demand across our nation for change, a demand for the republic promised in 1916. Our history cannot be encased in a museum or mausoleum; it is part of who we are, where we are from and where we want to go. That is why Sinn Fein developed a programme of events to mark 1916. We are seeking to encourage communities to engage with their heritage and to rise to the challenge of delivering a republic for citizens. It would appear that the Government is afraid to speak of Easter week, afraid of the challenge that it opens and afraid of the views of citizens. The most fitting tribute to the loss of past generations, including republicans, British and civilians is to deliver the republic promised on the steps of the GPO, a 32-county republic in which citizens have equality and rights and the sovereignty of the nation is protected. This generation has the opportunity and ability to deliver such a republic without the sacrifice of previous generations. There is a peaceful and democratic way to achieve this. But it will require leadership, determination and putting the needs of the nation above individual political position. Maybe the real reason the Government does not want to talk about the unfinished business of 1916 is that it will remind it of its failure and remind citizens that they retain the power to make good the Proclamation.